Slough Jet started November by playing against the Wildcats and the Swindon team were back for the penultimate weekend of the month. The middle period saw 5 goals scored at the game swung from team to team. Slough equalised thanks to Dan Davies netting a powerplay goal at 22.22 but Swindon were back ahead at 29.52 with Hoog netting his first. Ales Padelek made it 2-2 at 36.43 and Mindy Kieras put the home team ahead with 36 seconds left in the period. Ryan Watt levelled the game at 39.49 to end the middle period at 3-3. There were unfinished chance at both ends in the third period and the game looked to be heading into overtime with neither team able to break the deadlock until Hoog netted his second at 55.11 and left the home team needing an equaliser to fight back. Despite the last 1.16 being played 6 on 5 the equaliser didn’t come and Swindon took the points. Slough Jets and Peterborough Phantoms met up for the third time in the season with both teams winning their previous home games. The two teams were locked together in near equal competition in the opening period but at 10.43 Darius Pliskauskas scored to put Slough 1-0 ahead. By the end of the opening period the visitors had edged a shot advantage in 21 shots but it was still Slough’s goal that was the only one recorded. After a penalty free first period Michael Wales picked up the first penalty of the game at 27.52 and at 28.31 Tom Carlon levelled the game with a powerplay goal. Slough killed off a second penalty at 31.43 but with 57 seconds left in the period Jamie Line picked up at an interference penalty to give Slough their first powerplay which continued in the final period. Peterborough killed the 1.03 of the penalty but Ziedins then offered another powerplay at 41.27 which they again went on to kill off. The deadlock was finally broken at 50.49 when Dan Davies netted the game winning goal and with the teams playing 4 on 4 with both serving penalties Michael Wales added a safety margin with his third goal of the season. 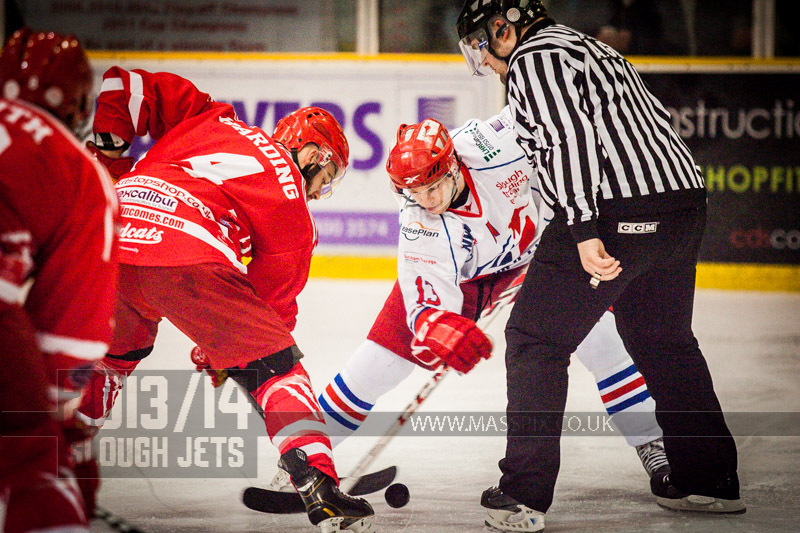 Slough Jets entertained Basingstoke Bison at the Hangar for two points in the league and cup. Following a ceremonial face-off with Joe Greener and Nicky Chinn with Slough Jets legend Gary Stefan the game got underway. 199 seconds into the game the visitors took the lead when Joe Miller scored but Mindy Kieras put one past his former team at 6.58 to level up the game. Viktor Kubenko scored at 11.41 to make it 1-2 and Tom Carlon netted the home team second to level up at 13.24 and with no further scoring the first period ended 2-2. Nicky Chinn scored his first of the night at 26.01 and Daniel Volrab scored at 27.47 to double the lead and Doug Sheppard called the Slough time-out. Chinn netted a second at 28.35 to make it 2-5 but the final half of the middle period passed by scoreless despite a total of 33 shots and ended 2-5. A Basingstoke powerplay saw them extend their lead at 45.22 when Ollie Bronniman scored and soon after Chinn completed his hat-trick at 47.58 making the game safe at 2-7. Despite some pressure at the end of the game Slough managed to pull back just the one goal, a powerplay strike, from Adam Calder at 58.18. Slough Jets started the weekend with a trip to Milton Keynes to face the Lightning. Slough took the lead early on in the game with Jan Krajicek beating Mettam at 7.16. Despite Milton Keynes gifting two further powerplays in the period Slough made content with their single goal lead for the first interval. Slough added to their lead back out in the second when Doug Sheppard netted at 24.31 but Milton Keynes pulled back a goal at 23.27 thorugh Monir Kalgoum with a penalty looming over Adam Greener but when Blaz Emersic picked up an interference minor the same player converted the powerplay at 28.06 to make it 2-2.